Two Trees’ proposed development near Brooklyn Bridge. Image: Beyer Blinder Belle Architects & Planners LLP. Opponents concerned that development would alter views of the bridge. On March 4, 2009, the City Planning Commission heard testimony on Two Trees Management Company’s plan to build a mixed-use development at 10 Dock Street in DUMBO, Brooklyn. Two Trees had previously submitted a proposal in 2004 to develop a portion of the site with a 16-story apartment building, but withdrew the plan prior to the final vote in the City Council. Many attributed the withdrawal to mounting opposition from the community and elected officials. 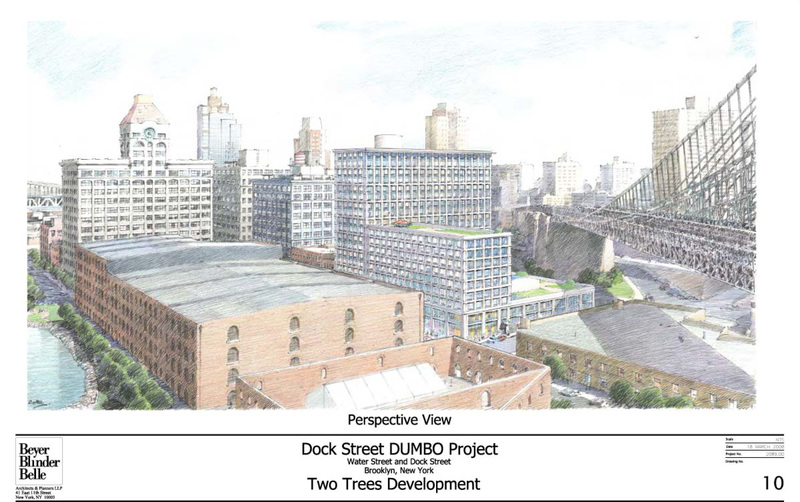 Two Trees later purchased additional land and submitted the current proposal, known as Dock Street DUMBO, which shifts some of the original proposal’s height away from Water Street. Bounded by Dock, Water, and Front Streets, the building would be located on a 45,000 sq.ft. site adjacent to the Brooklyn Bridge. The project would include approximately 323 residential units, a 300-seat public middle school, a 465-space parking garage, and a 12,733-sq.ft. retail space. The building’s tallest section would be approximately 183 ft. in height, and the section closest to the bridge would be nine stories. To facilitate the proposed development, Two Trees submitted applications for a map amendment that would create an MX-2 special mixed-use district and rezone about a half-block from M1-2 to M1-2/R8, and for special permits waiving height, setback, and rear yard requirements. At the Planning Commission’s hearing, Council Members David Yassky and Tony Avella opposed the proposal. Yassky, whose district includes DUMBO, stated that the neighborhood needed more housing, but expressed concerns that the project’s location and height would obstruct views of the iconic bridge. Although Yassky thought the area could use a public school, he believed it was possible to secure one even if the current project was denied. The Commission has until April 27, 2009 to vote on the proposal. CPC: Hearing on Dock Street- DUMBO Development (C 090181 ZMK – rezoning); (C 090183 ZSK – spec. perm. ); (C 090184 ZSK – spec. perm.) (March 4, 2009).